Barbados, Belize, Botswana, Brunei Darussalam, Cyprus, Dominica, Fiji Island, Ghana, Grenada, Jamaica, Kiribati, Lesotho, Malawi, Malaysia (for less than 30 days stay), Maldives, Mauritius, Namibia, Nauru, Papua New Guinea, Rwanda, Samoa, St. Kitts and Navis, Sierra Leona, Singapore, Solomon Islands, South Africa (for less than 30 days stay), St. Lucia, Swaziland, Seychelles, The Gambia, Tanzania, The Bahamas, Tonga, Trinidad & Tobago, Tuvalu, Uganda, Vanatu, Zambia, Zimbabwe, and St. Vincent and the Grenadines. NOTE: This is subject to change, please contact your nearest Kenyan diplomatic office to get the most up-to-date information. As part of this process, you will receive a confirmation email that you need to click on to verify and confirm your registration. At this point, you will be asked to upload a digital passport photograph (maximum size 500 pixels by 500 pixels). Once logged in, select Department of Immigration Services. Select the type of visa (visitor) and read the instructions carefully. You will need a scan of the main page of your passport (with your name, date of birth and other information). You will need to re-upload your passport photo. Pay using your Visa card, MasterCard or other debit card. Await your approval which will be sent to you by email. This could take up to 7 days so ensure that you plan in advance. 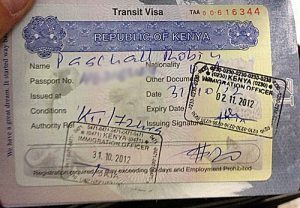 For entry into Kenya between July 2 and August 31, 2015, you can obtain a visa using the method above or upon arrival at the airport. Both single and multiple entry visas are available. If you get your visa at the airport, you will need cash to pay for the visa. Kenya, Rwanda, and Uganda: The East Africa Tourist Visa allows travel between these three countries using the same mutiple entry visa. This multi-country 90-day visa is available to tourists with a valid passport (valid for not less than 6 months from the time of visa application). You should apply for the visa from the first country you plan to visit. 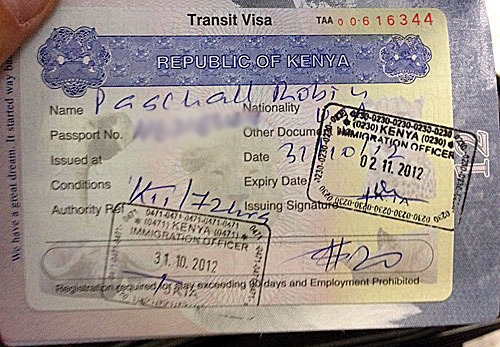 The East Africa Tourist Visa costs $100. Two passport size pictures — computer generated pictures are unacceptable. Payment by VISA, Mastercard, or debit card. Cash is acceptable only at the airport. A yellow fever vaccination certificate is required for travelers over 1 year of age arriving from countries with risk of yellow fever transmission. This includes Uganda and Rwanda. See the World Health Organization International travel and health website for disease distribution maps listing countries with risk of yellow fever transmission.